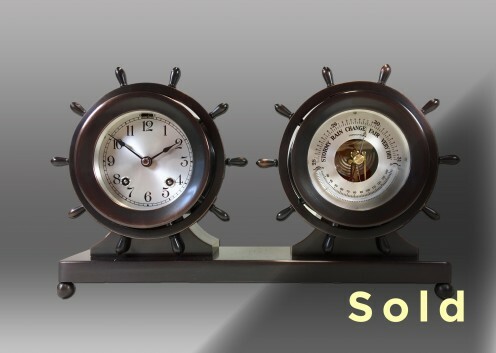 This 3 ¾” Claremont Clock & Barometer Set was originally sold to Honorable Ernest Lee Jahncke, former US Secretary of the Navy, on February 23, 1935. This set has a full bronze finish, hand-silvered faces, hinged bezels, and miniature yacht wheel handles. Clock features the original Chelsea Ship’s Bell movement and barometer includes a thermometer tube. It has been completely overhauled, including the refinishing of the dial, hands, and reflector. Serial #197115.